I’m going to tell you about a secret town – it’s actually one of the oldest towns in the world. You’ll be surprised to learn that it’s in Southern Italy and I’m guessing that you’ve probably never heard of it. I hadn’t. 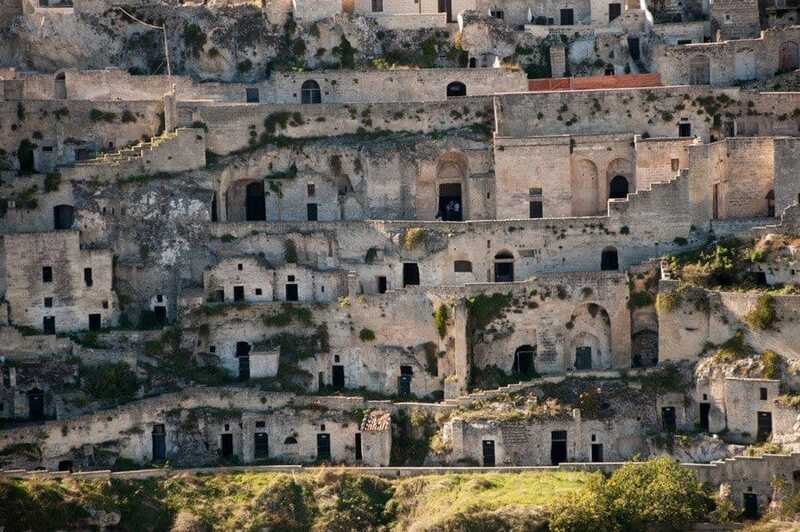 Matera is one of the oldest inhabited places in the world where people have lived continuously for over 9,000 years. Just think about it – that’s incredibly old. It’s a crooked, crumbling, tumbling town filled with cave-dwellings, churches and an intense sense of history. 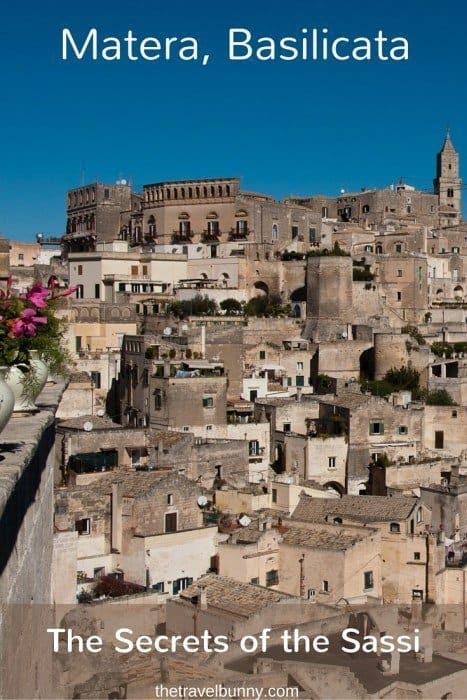 Matera is a city in the Basilicata region just below the ankle of Italy’s boot near Puglia. Located on a rugged ravine which has a small stream, La Gravina, running through it, prehistoric settlers have dug their dwellings straight into the soft volcanic tuff since the Palaeolithic period. 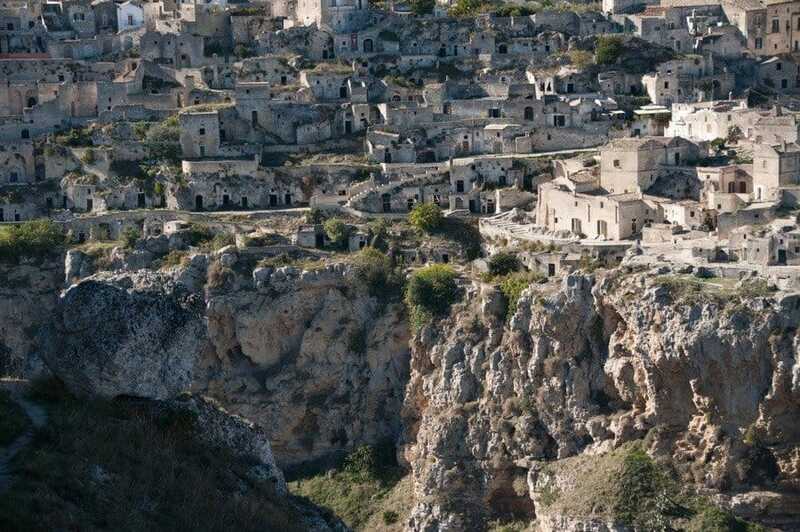 The cave-dwelling district is called Sassi and Sassi di Matera means Stones of Matera. Our first glimpse of the Sassi was from the opposite side of the ravine, La Belvedere. As we walked to the edge of the canyon bright green lizards scorted away from us and the aroma of fresh thyme filled the air as our footsteps bruised the leaves of the wild-growing herb underfoot. This is the best view of the town and shows exactly why Mel Gibson used it as a substitute Holy Land when he filmed ‘The Passion of the Christ’. The view is of a honeycomb cluster of small, square hovels layered higgledy-piggledy on top of each other. A labyrinth of steep winding staircases pick their way through the jumble of connecting cave houses and we could see where rows of flat rooftops formed the streets of the level above. The homes were originally carved out of the rock and extended with facades to look like normal dwellings connected by underground passages and tunnels. People in Matera lived in the caves with their animals (donkeys, chickens and goats) and without running water, sewers or electricity right up to the 1950s. 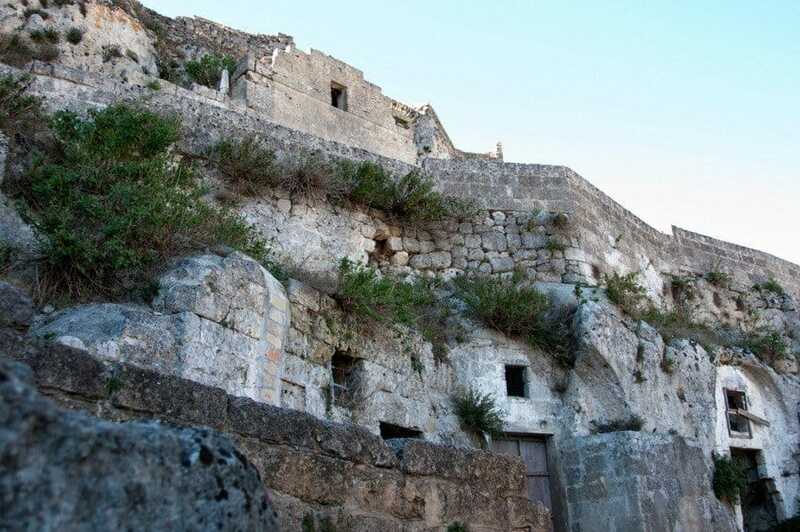 Poverty and disease were wide-spread and it wasn’t until Carlo Levi’s book ‘Christ Stopped at Eboli’ that people became aware of the appalling conditions suffered by the cave-dwellers in Matera. To address the situation the Italian government evacuated the caves and moved the occupants to new public housing in the modern (upper) part of the city – this took almost two decades. 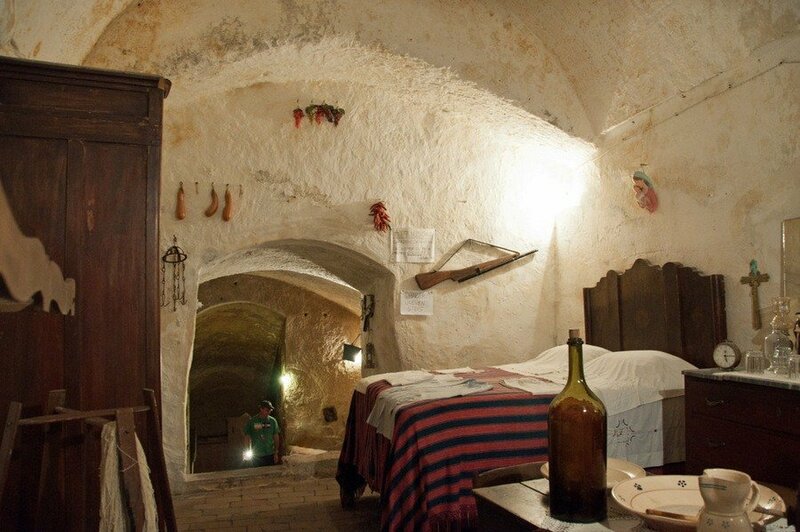 We visited a reconstruction of a typical 20th-century cave dwelling, Casa Grotta di Vico Solitario. 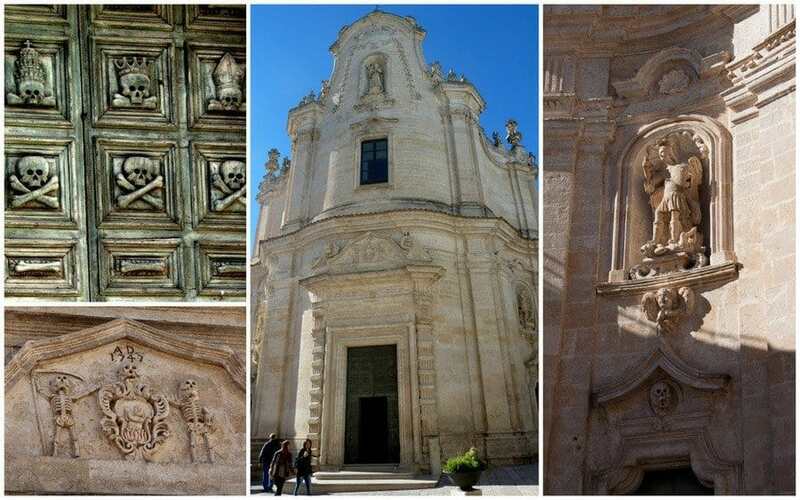 There are around 140 rock-cut roman and baroque churches in Matera. St. Antoni church consists of four connecting churches built between the 12th and the 13th centuries. They house a crypt and vault and there are millstones and cellars used to produce wines at some stage in their history. 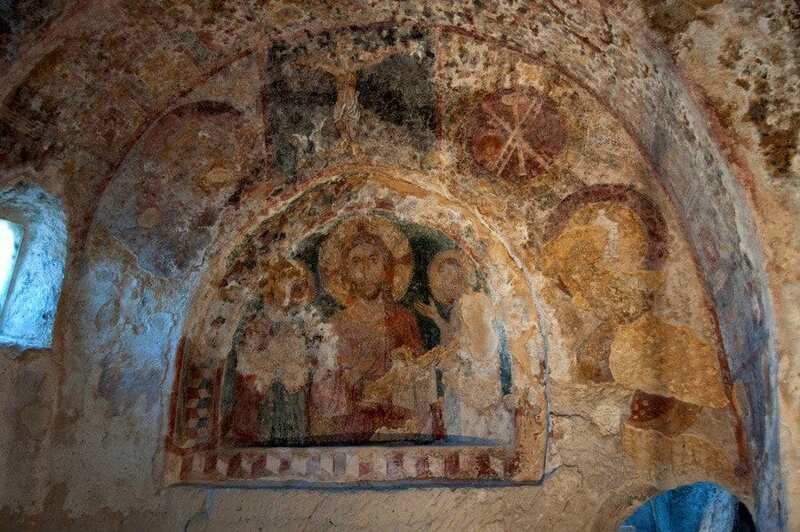 The remains of frescoes are the main attraction. Matera’s divided into two parts, the more “modern” city, dating from around the 13th century, has several churches, museums, and squares. There’s a pedestrian area with cafes and bars where we stopped for a Peroni – it was a really hot day for November! This part of town reminded me of Goreme in Cappadocia, Turkey where we stayed in a cave hotel and the Sassi cave houses similar to the Derinkuyu Underground City although not subterranean. Basilica Cathedral dominates the town’s skyline with its bell tower. The Church of Purgatory caught my attention with its unusual theme of death, fashionable at the time of building, in 1747. Death was considered not as an end but as the beginning of a better life. There are carvings of skeletons, skulls and angels with more unusual details of flames enveloping repentant souls. The wooden door is divided into 36 panels with skulls and crossbones, sometimes crowned with headwear belonging to different classes of society, showing that all men are equal after death. 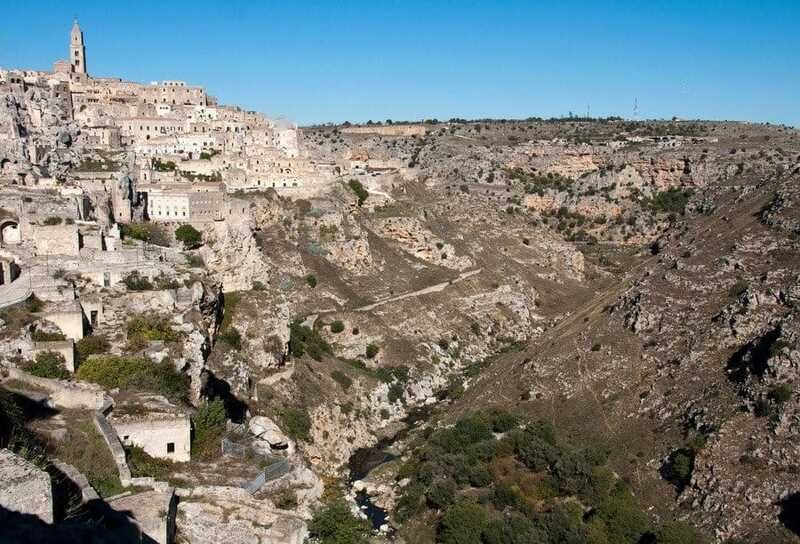 Matera was declared a UNESCO World Heritage Site in 1993 for being “the most outstanding example of a troglodyte settlement in the Mediterranean”. Since then visitor numbers have slowly increased. 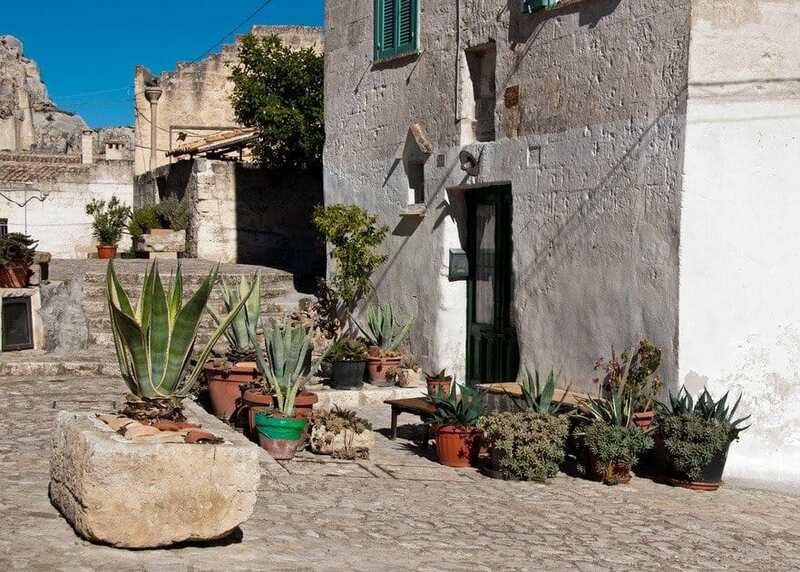 Many of the caves have been renovated and used as homes, hotels and restaurants but in Sassi Caveoso, in the lower town, most of the caves have remained empty. It’s a fascinating side of town where you can wander the silent cobbled streets and twisting alleys; take steps and stairs and turn a corner for a view of tumbling rooftops and weather worn walls and get a feel for what is was to live here years ago. Only the cats will keep you company. I can imagine Matera in 10 years time being a complete boutique town filled with cave hotels, bars and restaurants with none of the empty caves left in their original state. If you’d like to see it before that happens go now; enjoy the peace and calm of a city that’s steeped in millennia of history and where you really do feel like you’ve stepped back 2000 years in time. My trip to Matera was part of a Celebrity Cruise excursion. 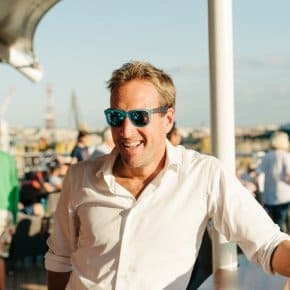 Many thanks to Celebrity Cruises UK for hosting our cruise. As always views and opinions; good, bad or otherwise are entirely my own. we too worry that being selected as the 2019 Cultural City will change this city so we were glad to visit in October of this year. The church of Purgatory was also one of our favorites – so beautiful inside if you get past the skulls! I’d have liked to have seen the inside but didn’t have time. Let’s hope it becoming City of Culture in 2019 won’t change it. We were in Matera on 17th Oct 2014, the day it won its bid to be European City of Culture 2019. I greatly fear that this very special and peaceful place will be spoiled by having more visitors. It was the highlight of our ten-day visit to Puglia (though Matera is actually in Basilicata). BTW the trulli houses of Alberobello weren’t that interesting – nowhere near as interesting as Matera even though both are world heritage sites. I also had never heard of Matera. It looks stunning! 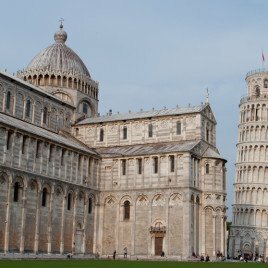 I’m planning a trip to Italy for a couple of month’s time and have no idea which part to visit… this might have swung things in favour of the south! 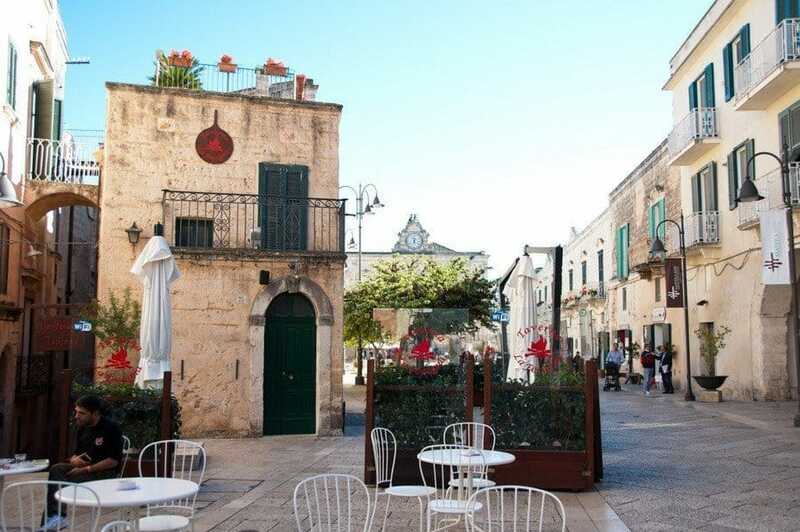 It’s a lovely part of Italy – I’d love to see the Trulli houses in Puglia which are nearby too. That looks so beautiful! 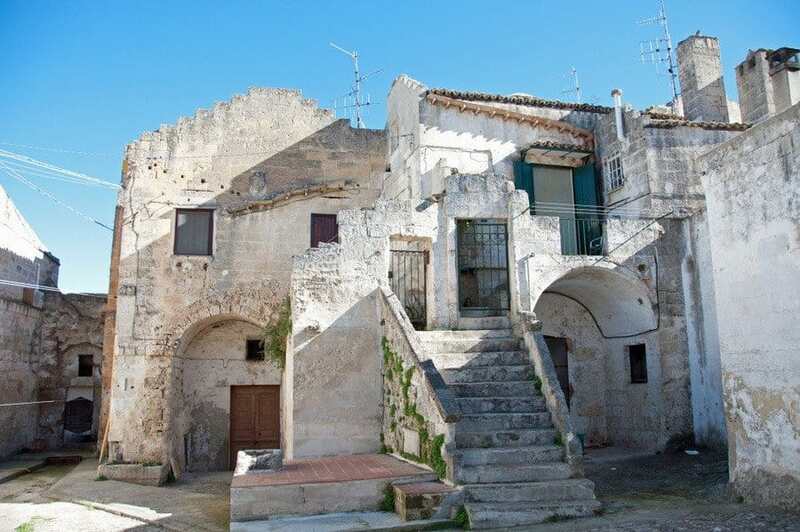 I have long since wanted to visit Basilicata as I have a historical connection to it. 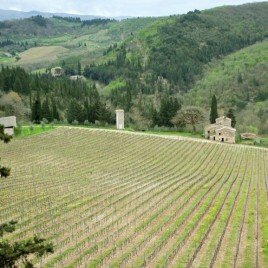 I know that the south of Italia is one of the lesser visited in the country, but it is amazing and much more ‘Italian’. Thanks for sharing! Thanks for dropping by – I hope you don’t have to wait to long before you visit. I’m intrigued by your historical connection…? 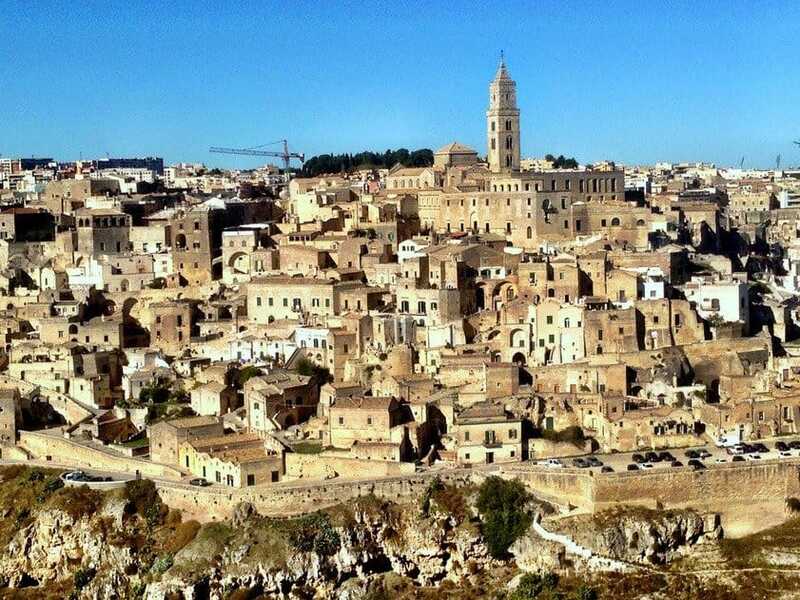 You seem to have a special knack for finding exceptional places; really enjoyed reading about Matera and seeing your pics. Thank you – I have a penchant for quirky places! Since I’ve been the name Matera seems to be popping up everywhere! I just learned about Matera a few years ago and I’ll bet if I ask my Italian mom about it, she’ll say she has never heard of it! Ha! Ha! 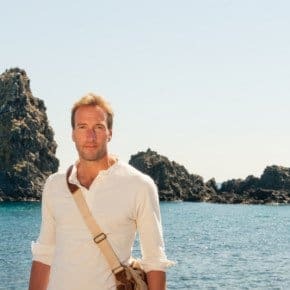 I hope to be able to visit this beautiful historic site before it becomes too commercialized, and I hope that it will be preserved for future generations as a historical treasure! 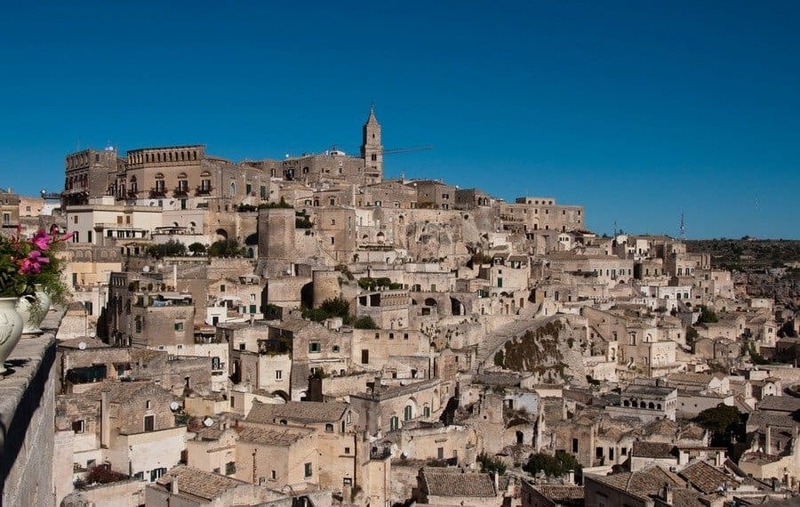 I think Matera’s really on the map now – you’re right, go before it becomes too commercialised. Let me know if your Mum’s heard of it! I love how this city has escaped the mass tourism and modernity that have plagued many cities in recent years. You can still get a feel of what the city was like based on the architecture – its incredible! It looks like a great place to visit! It was a lovely place to visit and I really hope it retains that sense of place. Wow, what an amazing. What a trip you were on – you’re so right I have never heard of or never been to a place even close to this. Just fantastic how they have manage to keep the town intact, even if not livable today. In a way I don’t hope that they will destroy the old part of the two with bars, restaurants and hotels – and it’s a pity that it’s empty. I can see why Mel Gibson chose this place for his making. Very interesting post again, Suzanne – and beautiful photos. I wanted to go there when I was in Puglia last summer, but the public transport was a bit awkward. Did you go on a trip from Bari port? We did Rich but I think there’s a train that goes from Bari. I can try and find out if you’d like? Too late now! We were staying about half an hour from Bari in a place called Polignano a Mare and couldn’t be bothered with two trains. Shame because your photos make it look worth the hassle! We went to Matera on a public holiday. It was so crowded we could hardly move. I thought it was a fascinating place and I would love to go back and have a better look. The less said about Mel Gibson the better. It was quiet when we visited in November; I agree it’s fascinating – seems like I’m one of the few who hasn’t actually heard of it! Wow, the cave dwellings must have been amazing to see in person! They were – I can’t believe that people lived there so recently, it must have been cold in winter. Good post – I am so cross with myself for missing this place when I visited Puglia last year! Looks like a fascinating and beautiful place. I would dearly love to visit one day. How lovely Suzanne. Matera looks gorgeous! Suzanne, this is just my kind of place! I love these historic and often abandoned ruins; I’m putting this on my bucket list for my “someday” trip to Italy. I hope you don’t mind if I link to this post from my bucket list, so I’ll remember! 🙂 Your photos are phenomenal, by the way. Places like this seem to be able to transport you back to the past when there’s little modernity around which is why I especially like ruins too!